Ayodhya Faizabad Development Authority has launched housing scheme for vacant properties. EWS, LIG, HIG and MIG Houses and plots under the schemes. Total 18 Schemes have been launched by the authority and these schemes consist of a number of flats, plots and shops. Ghaziabad Development Authority has launched another scheme in Indirapuram where it is offering a total of 370 multi-storey flats. The authority is offering 2BHK, 2BHK Delux , 3BHK and 4BHK apartments under the scheme. The prices of the flats starts from 52.79 Lakhs for 2BHK flats to 84.53 Lakhs for 4BHK flats. The applications for the scheme are being invited through the online mode from 1st November and the last date of application registration is 30th November. YEIDA has launched a new flat scheme in Sector 22A offering 1BHK and 2BHK Multi-Storey flats . The authority is offering a total of 2822 flats under the new scheme. There are 2070 1 BHK flats for the lower income group (LIG) and 752 2BHK flats for medium income group (MIG). The registrations will start from 3rd November 2014 and the last date of registration is 2nd December 2014. After the announcement of affordable housing flats in Nandani & Gangotri Enclave in this month, Uttar Pradesh Avas Vikas Parishad has announced a new scheme of semi-finished apartments in Kanpur under Hanspuram Yojna 2. 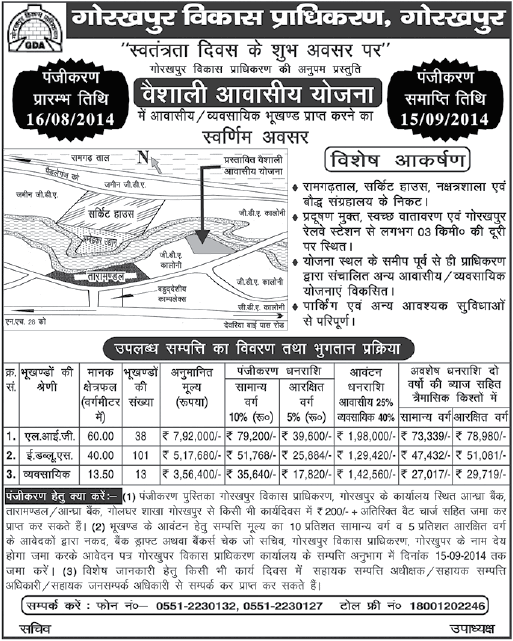 Registration for the Hanspuram Yojna 2 will start from October 11, 2014 and end on November 11, 2014.